Greater Tacoma Community Foundation offers a variety of tools and resources to help make charitable gift planning easier for professional advisors. 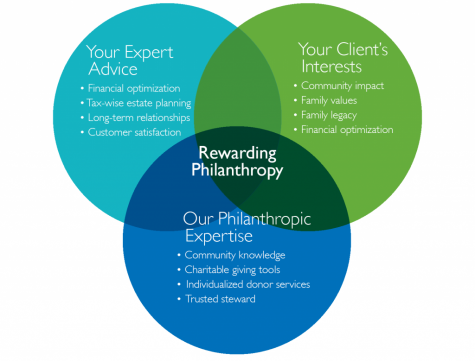 Whether you are an attorney, financial planner, or tax advisor, we can assist you and your clients in establishing an enduring community legacy and achieving the full tax benefits for their charitable contributions. We add our expertise to yours to ensure that your clients make educated decisions while selecting from a full spectrum of giving vehicles. A member of our development team is happy to meet with you to provide you with the tools you need in your client meetings, from tax scenarios to prepared fund agreements. To help you and your clients navigate decisions related to charitable giving, we have put together a website just for you. The site provides calculators with clear and understandable gift illustrations, while offering regularly updated donor stories to provide examples of how charitable gifts enhance and strengthen client’s financial, philanthropic and estate plans. Lastly the site contains numerous resources like up-to-the-date private letter rulings, news from Washington D.C., and monthly articles about trends in philanthropy and planned giving. There are a variety of funds for your clients to choose from depending on their level of giving, their philanthropic values, desired tax advantages, and desired level of involvement. Donors can choose to set up and make gifts to their funds in a variety of ways including cash, real estate, marketable securities – such as stocks, bonds, and mutual funds – life insurance, bequests, and approved personal assets. Establishing a named charitable fund for your client is easy. Here are 3 steps to get your client started. Choose the type of asset your client would like to use to establish a fund. A donor can contribute cash, securities, or other assets. Contribution amount must be at least $10,000 to establish a named fund. Choose the type of fund your donor would like to establish. The type of fund they choose depends on factors such as their desired level of involvement, amount of their fund, etc. (link to fund descriptions. Contact Evelyn Ryberg, Director of Philanthropic Services at 253.345.4172 or email eryberg@gtcf.org to create a fund agreement for your client. Donating appreciated securities often allows donors to make a bigger philanthropic impact and enjoy greater tax advantages than donating cash or selling stock and donating the proceeds. Greater Tacoma Community Foundation offers expertise in even the most complicated charitable transactions. By donating appreciated securities, you bypass capital gains tax and may be able to deduct the fair market value of your gift. Stock donations may be made to the any type of fund at GTCF. They may also be used to create a charitable remainder trust or other planned gift. Please contact Evelyn Ryberg, Director of Philanthropic Services, at 253.345.4172 or eryberg@gtcf.org for more details on how to calculate the deduction value and donation instructions for publicly traded or privately held securities. I give, devise and bequeath to Greater Tacoma Community Foundation, a Washington nonprofit organization (Tax ID #: 91-1007459) [$_________________________ OR ____________% of my estate OR the remainder of my estate] to establish an endowed component fund to be known as the ______________________________________________ Fund.I direct that the annual net grant amount of the fund, as established by Greater Tacoma Community Foundation’s current spending policy be used as described in the separate Memorandum of Understanding filed with The Greater Tacoma Community Foundation. I give, devise and bequeath:(describe assets which are the subject of the bequest (for example, a stated sum $________ OR a _____% percentage of the estate OR the remainder of the estate) to Greater Tacoma Community Foundation, a Washington nonprofit organization, to be added to and become a part of The __________________________________ Fund, and to be held and administered subject to and in accordance with the provisions of the agreement entitled “The __________________________________ Fund” entered into by ____________________________________________ and Greater Tacoma Community Foundation on _____________________________________, 2_____.